How Do Fillings Stop Tooth Decay? A cavity isn’t just a source of toothaches, but a real danger for the health and stability of your smile. In order to treat cavities and safeguard smiles in Woodland Hills, CA, our team will offer a lifelike and metal-free dental filling. 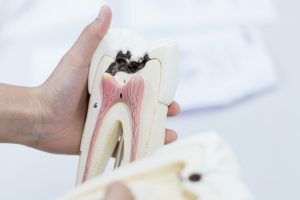 What benefits will these fillings offer and how do we know if we need treatment for dental cavities? In order to protect your smile, you need to know how a cavity forms. Typically, the outer layer of tooth enamel protects our teeth from cavities. However, should the enamel become compromised, then harmful bacteria will reach the inner layers of dentin, causing a cavity to form. Poor oral hygiene could lead to plaque buildup, which erodes enamel over time. Injury that chips or fractures a tooth could also expose the dentin to bacteria. Patients with a cavity may notice tooth sensitivity to hot or cold foods and drinks. Others may begin to experience a toothache that grows worse with time. Don’t ignore discomfort, please see us as soon as possible for a checkup! If we uncover the presence of a cavity, then we will offer restorative treatment. In most cases, a dental filling is enough to stop your decay. After we clean the tooth and remove decay, we apply a metal-free composite resin. We shade the material to match the rest of your tooth. We then cure the material under a light before polishing the tooth to complete the filling. If you have an advanced case, or an infection, then a filling may not be enough. Instead, we will create a custom-made and lifelike ceramic crown, which fits over the tooth. If you have an infection, we also perform a root canal to remove the infected tissue for the tooth. Following treatment, your tooth will look completely natural. How do you avoid cavities? First, be sure you care for your smile from home. Routine care limits the amount of plaque that can accumulate on your smile. You should brush your teeth twice daily and floss every night before bed. You also need to see us every six months for a checkup and cleaning. During the checkup, we examine your smile for the earliest signs of decay, so we can treat the problem before you experience toothaches. The cleaning enables our team to remove all plaque and tartar from the teeth, reducing the risk of a cavity forming. We have custom-made and lifelike solutions to tooth decay. Schedule a consultation to discuss the benefits of preventive dentistry by calling Woodland Hills Dental Arts in Woodland Hills, CA, today at (818) 347-5124. We also proudly work with patients from Thousand Oaks, Westlake, Encino, Sherman Oaks, and all other surrounding areas.